This weekend I had Matt take some pictures of Decimal for me so I can do up the full FO report. 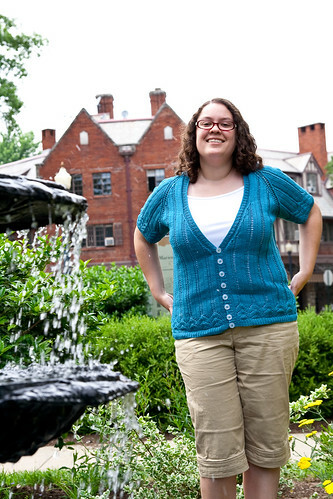 Notes: I knit the 49″ size. I did make a few modifications. 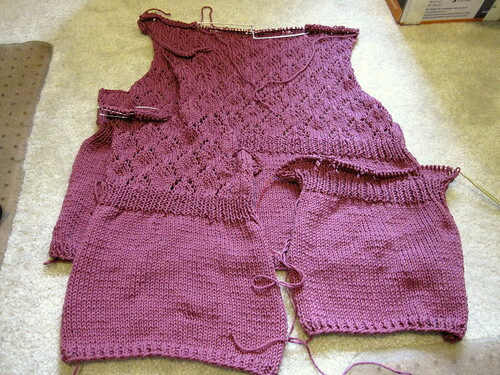 I added an additional border repeat to the bottom and sleeves of the sweater (3 instead of the called for 2). I also changed the sleeves to be short sleeves instead of 3/4 length bell sleeves and knit them in the round instead of flat. Instead of sewing the buttons on at the end, I decided to knit them in instead so that I had less finishing. 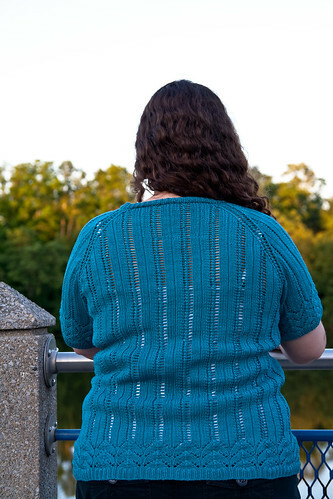 When I joined the sleeves to the body, I did the bind off for both the sleeves and body where the armpits are at the same time so I didn’t have to sew them later. I wanted minimal finishing and I definitely got it! I had all of 3 ends to weave in at the end since I was weaving them in as I joined new balls of yarn or came to a knot in the yarn (there weren’t many of those, thankfully). In this post, I talked about how it was too long initially. Then I washed it in the washing machine in warm water then ran it through the dryer, which shrank it an inch in length, which I talked about here. 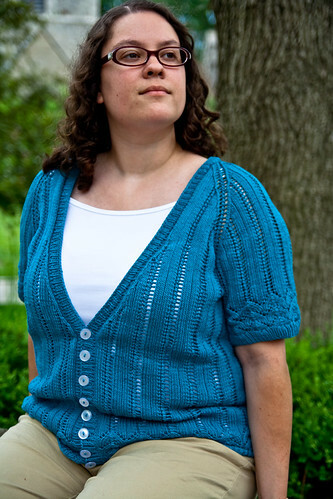 If I were to knit this again, I’d probably take out 2 to 3 inches in the length of the body somewhere. Possibly even in the top/shoulder area because the buttons start a little lower then I expected. I do love how the final product turned out once I washed it, though! This weekend I had a lot of time to work on Hey Teach, so it’s coming right along. I have now finished the back, left and right front pieces. I started on the first sleeve today. I haven’t taken a picture since I finished the right front yesterday, so here’s what it looked like yesterday morning. I’ve done a little work on the Sprucey Lucy socks, too. I don’t have an updated picture, though. After ripping out the Lacy Ribs sock, I decided to go up a needle size for the Sprucey Lucy socks and I like how they’re turning out a lot better. I re-knit up to the heel, then tried it on and realized it wasn’t long enough, so I ripped out the heel and I’m adding another inch before doing the heel again. I really love how they’re working up in The Yarn Bearer’s Uber Sock yarn! that looks stellar on you! you should be VERY proud of yourself! that color looks great. Oh, your Decimal is just lovely!! !